Though the Las Vegas Strip provides a glittering backdrop, to the drivers at Gene Woods Racing Experience, the blinking lights are all a blur. 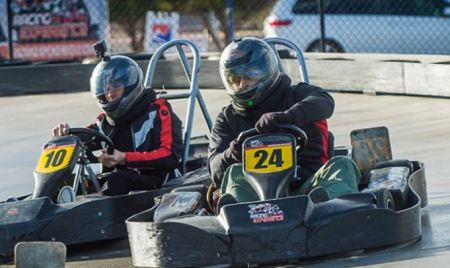 Behind the wheel of high-performance go-karts, they zip around the 3/8-mile track at up to 45 mph, which is faster than a standard go-kart’s top speed. Drivers learn to commandeer the speedy karts through an instructional video before they are let loose onto the curving track for 20 heart-pumping laps. Between races, competitors can go head to head in the arcade, or call their father to tell him about what a good job they did on the track.